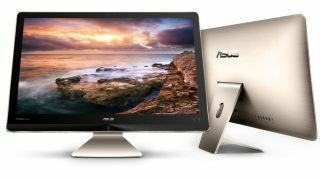 Asus has unveiled a new all-in-one PC that looks a lot like the new Apple iMac; the 23.8-inch Zen AiO Z240IC and 21.5-inch Z220IC may even share the same ODM (original design manufacturer) as the iMac, since Asus has a strong relationship with Pegatron which it spun off five years ago. There's the aluminium unibody we're used to, one which tapers to edges only 6mm thick. The bezel though is far thicker though and there's brush lines at the back. The main hardware components include an Intel Core i7 processor (Skylake or Haswell-E) paired with up to 32GB DDR4 RAM, up to four PCIe Gen 3 512GB SSDs and a discrete Nvidia GeForce GTX 960M GPU with 4GB of RAM. Add in six speakers with a total of 16W output, two array microphones, voice recognition for Windows 10's Cortana, Intel Realsense 3D camera and you have a pretty compelling all-in-one PC. Asus has not stated yet when the Zen AIO will be available globally or how much it will cost.